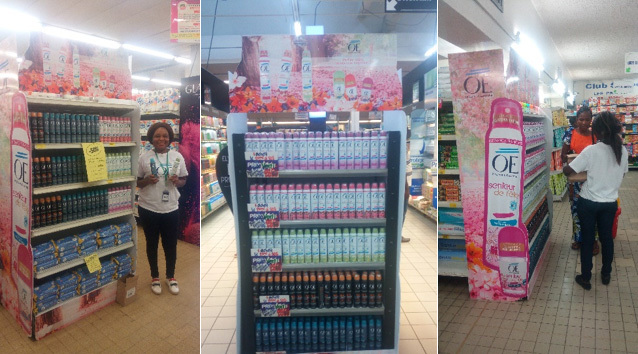 The OE brand is In the spotlight during the Back to School period and has taken advantage of the high footfall to announce the launch of the new fragrances which have recently been added to its Infinis deodorant range: Senteur de Fête, Jasmin Enchanteur and Rose Voluptueuse . It’s an opportunity to introduce customers of the Prosuma store to these new fragrances, with promoters hired and trained for the occasion, and to boost their loyalty to the OE brand with sales up by 30% over the period! Our thanks go to the Hyper Hayat, Casino Cap Nord, Sococé 2 Plateaux, Sococé Zone 3, Cash Plateau and Cash Djibi stores, as well as to the Luxsor branch, for their close collaboration over this period. N.B. Unhycos brands have been on the market in Ivory Coast for almost fifteen years.